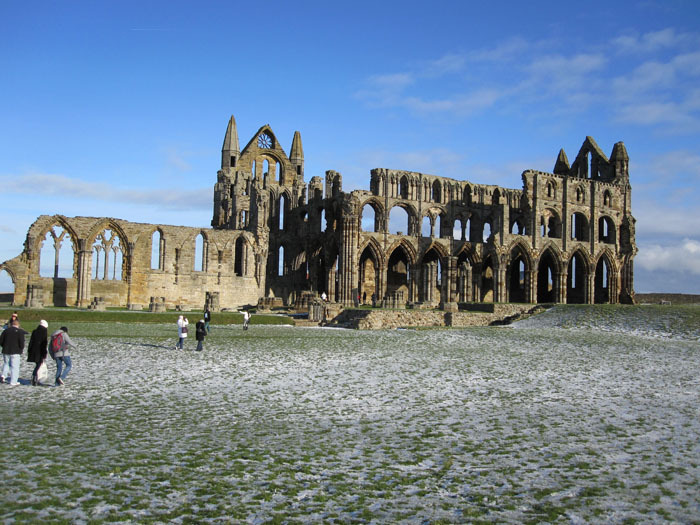 The town of Whitby is known for Whitby Abbey, a ruined abbey set on the cliffs over the North Sea. The Abbey is absolutely stunning. It had to be one of the most well-documented sites in the world. All of us were snapping photos like crazy (or at least I know I was). It was cold up on the cliff, but the sun was shining and the sky was a brilliant blue with few clouds. 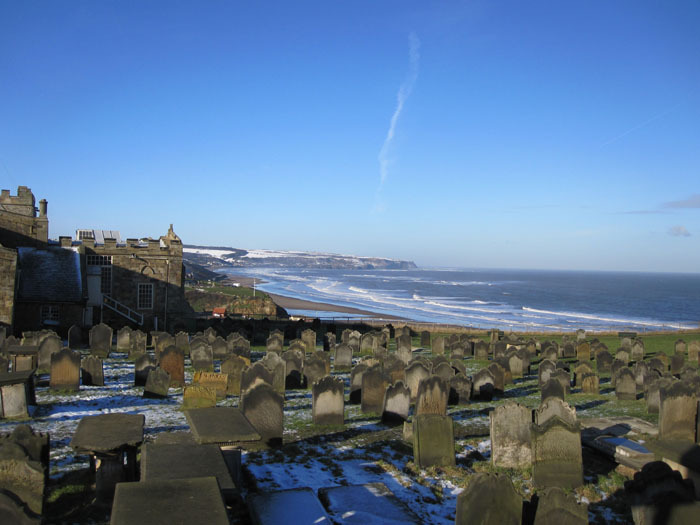 Whitby is also famous for being a setting used in Bram Stoker’s Dracula. Obviously, the town played up on this, and there were several touristy Dracula “museums” and shops. Adjacent to the Abbey was St Mary the Virgin Church and a creepy, sprawling graveyard. From there we descended the 199 Steps down in the town. 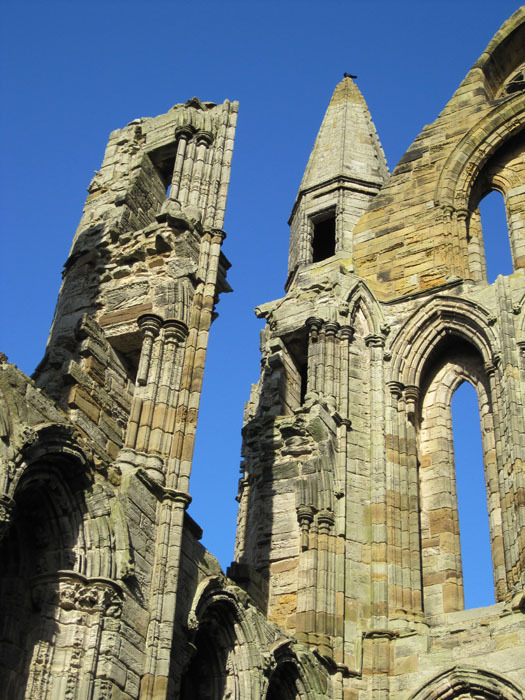 We wandered Whitby’s cobbled streets and found lunch at the Monks Haven restaurant and tearoom. 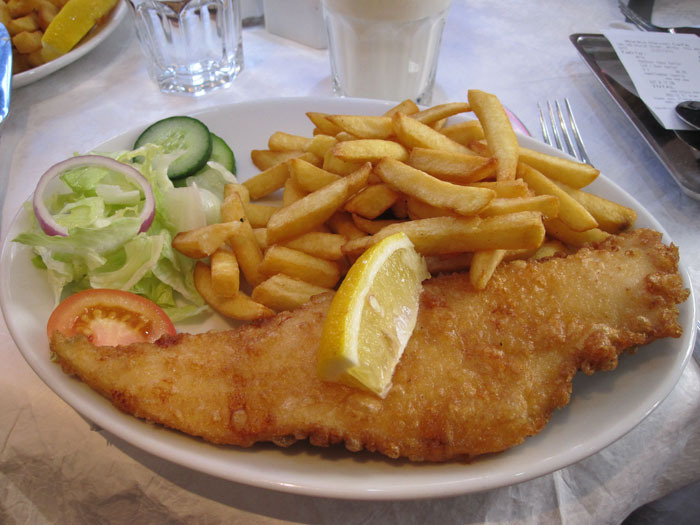 Being in a seaside town–and in England–I appropriately had fish and chips (of the haddock variety). I hardly even need to tell you that it was delicious. I discovered that I liked to put something called HP Sauce on the fish. I’m not sure if I was using the sauce for the right purpose, but it was a great sauce nonetheless (sort of like a mix of barbecue, vinegar, and mayonnaise–it’s hard to describe). We went into several bookshops and novelty stores, leisurely making our way across the bridge and to the other side of the harbor. 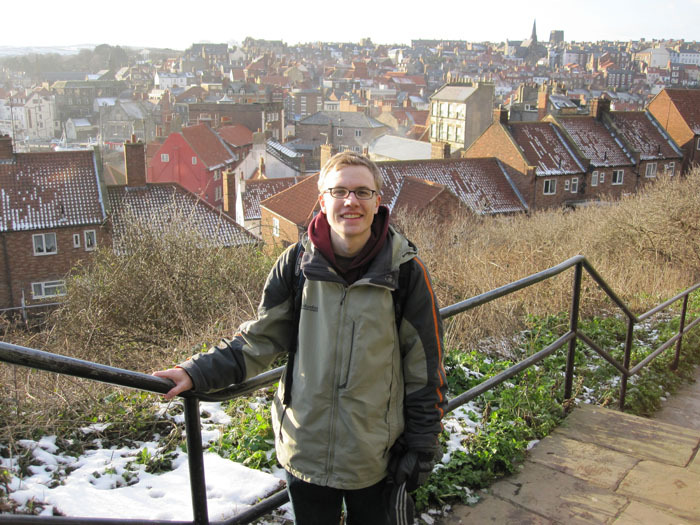 On the other side was a memorial to Captain James Cook, who was born in Whitby. 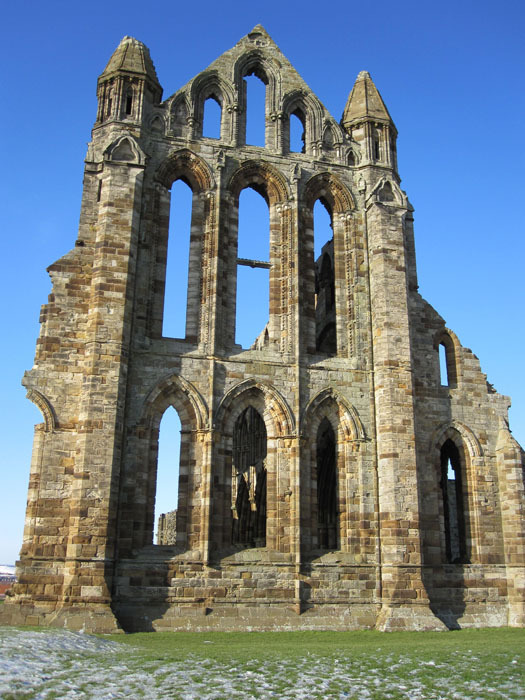 From there we had excellent views of Whitby Abbey, on the opposite cliff, and of the town below. 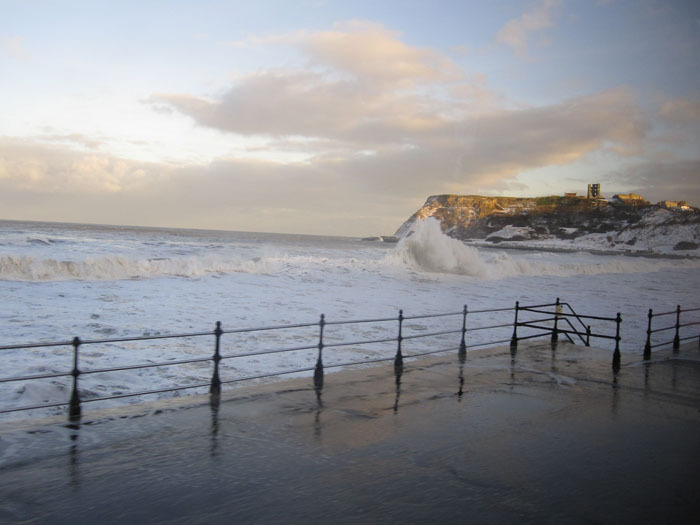 A few of us went down to the beach and took pictures of the waves of the North Sea, which were white and wild. 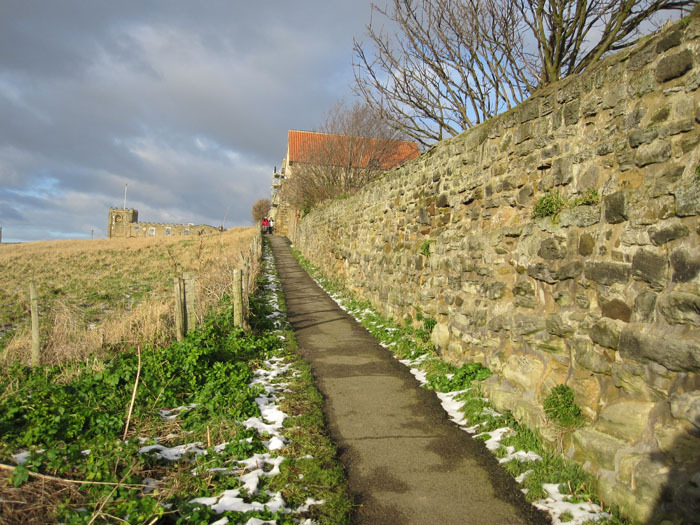 On our return journey, we took a path called Caedmon’s Walk back up to the Abbey. 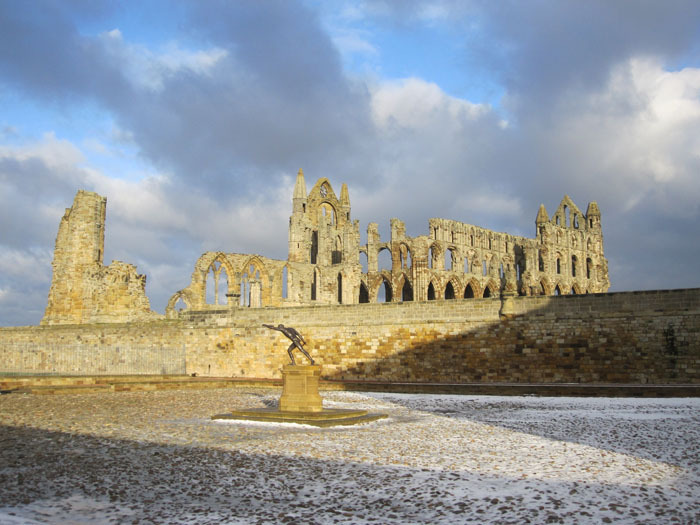 The stairs were a little icy, so we had to tread carefully, but the Trod provided more magnificent views of the town, harbor, and, of course, the Abbey in all there vividness. The colors were spectacular and the snow sprinkled here and there was a nice touch. After I got back in my room and rested for a bit, I went to the Spar To Go (a small convenient store just a few streets away from the Grange, where I live) and bought a ham sandwich and a Coke for dinner. I’m still gauging how this whole groceries-and-weekend-food thing will go (you see, the dining halls are not open on weekends). If nothing else happens tonight, I’ll just go to bed early since classes start in the morning. I have 3 tomorrow, from 10:30 AM till 5:30 PM. Although, having a packed Monday will make for a relatively easy rest-of-the-week! Pray for me as I begin the “school portion” of this journey. Well, I am officially jealous of you little brother. Not that I really wasn’t before. It is too awesome that you get to go all these places in one of the coolest countries. Good luck on starting class with those accented folk. Good Luck with your first week of classes! Praying for you! Thank you for the pictures and blog postings.